For those who think too much is never enough, we introduce to you the pleasant handling, even more excessively powered, Polaris Scrambler 1000! With the success of the Can-Am Renegade 800 and 1000 sport 4x4s, we wondered how long it would take for Polaris to react with a modern, big-bore, sport 4×4 of their own. 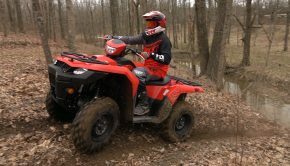 Polaris took their time, but answered in a big way last year when they introduced the 2013 Scrambler XP 850 which was based on their phenomenal Sportsman XP 850 sport/utility machine. The Scrambler is a blast to ride, with good handling, superb suspension, paired with a 77 horsepower, twin cylinder. The engine is amazingly manageable, although it possesses more power than most riders will make full use of. The overall package the Scrambler delivered was good enough that the XP 850 beat out Can-Am’s Renegade 1000 as the overall winner in a shootout performed by ATV Rider Magazine. Already arguably having the best sport 4×4 in the business, we were anticipating the release of a Scrambler 570 at some point. Needless to say, we were a little surprised when Polaris doubled down on their WMD program. The displacement war is alive and well in 2014.Polaris didn’t want consumers having to choose between the biggest and the best, so please let us have the pleasure of introducing you too the 2014 Polaris Scrambler XP1000! The Scrambler 1000 is essentially a pumped up version of the Scrambler XP 850 LE. The 1000 receives the 850 LE’s Fox Podium X shocks, cast aluminum wheels, digital instrument display, and LED headlights. 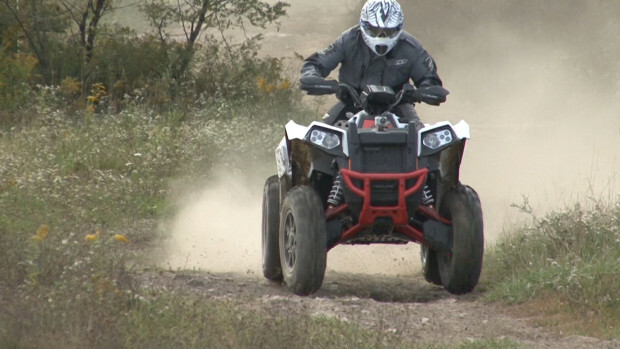 According to Polaris the chassis and suspension shared among the two machines was optimized to work well on both models. The XP1000’s engine is based on the XP 850’s. They both feature parallel twin cylinder, water cooled four-stroke engines with four valves and single-overhead-cams per cylinder. Compression ratios are identical at 11:1. They even use the same cam profile and dual 42mm throttle bodies. The big difference is in displacement. With a 3.5mm larger bore and 2.5mm longer stroke, the 1000 features a 90.5mm bore and 74mm stroke, boosting displacement from 850cc to 962cc. The 1000 is said to put out over 85, which would make it the most powerful ATV on the market! The exhaust system was revised to provide better flow for the pumped up engine. Dual stainless steel silencers increase flow and tell you at a glance who you’re messing with. Additional flow at the headers was achieved by increasing the primary headers diameter from 1.375 inches to 1.625 inches. Cooling capacity is also claimed to have been enhanced on the 1000. While the 850 is claimed to produce 77 horsepower, the 1000 is said to put out over 85, which would make it the most powerful ATV on the market! Our Short but Thrilling Ride! Decked out in our Fly Racing Patrol, over the boot pants and jersey, F-16 gloves, Three.4 helmet, and Patrol riding jacket, we were dressed for unpredictable fall weather and our first short ride on the Scrambler 1000. The Scrambler 1000 is undoubtedly big, yet the cockpit welcomes riders of most sizes with its modern ergonomics that are slimmer through the midsection than you might expect. On the trail the 1000 performed exactly as expected, like the 850 with even more excessive power. The 1000 may have an advantage in flat drag races or when churning huge mud tires through the slop,but the fact that the Scrambler has 22 horsepower less thanthe RZRXP 1000 side-by-side is a real indicator that the displacement war is becoming almost pointless. That being said, the Scrambler 1000 isn’t a mindless brute. It’s well-mannered and very manageable for an experienced rider. The engine is so smooth that you can pick your way through technical stuff, while possessing the brutality to shred the tires exiting any corner, at nearly any speed. With so much torque and power to spare, the 1000 effortlessly growls its way up steep inclines at lower RPMs. This motor lets you get through the boring sections quickly and happily takes its time exploring scenic or challenging areas. This motor lets you get through the boring sections quickly and happily takes its time exploring scenic or challenging areas. Equipped with both high-and low ranges in the PVT transmission, the only limits to your towing ability will be available traction. With so much power on tap, we’re glad the chassis and suspension work as well as they do. The 48.6 inch width and 53 inch wheelbase yield a stable, predictable ride when attacking corners or steep hills, although it was impossible to bury the throttle from a deep stop on high traction surfaces. The EPS is flawless at slow to intermediate speeds, but the steering is a little light at warp speeds, especially under acceleration. Just a touch of front end scrub keeps the machine from feeling unmanageable when you’re really charging.The light, agile feeling front end and touch of front end push lets you attack corners aggressively without making you feel overwhelmed or doing anything surprising. The Scrambler could easily be the best suspended big bore 4×4 ever. Polaris has been specializing in building 4x4s ATVs with gobs of plush suspension travel for decades now. With dual A-arms and Fox Podium X shocks controlling 9 inches of ravel up front and 10.25 inches out back, The Scrambler could easily be the best suspended big bore 4×4 ever. Small bump absorption and articulation on rocks is excellent. Whoops and rolling bumps can be attacked with surprising ease. The shocks never seemed to pack up or deflect. The superb suspension action makes the Scrambler 1000 feel far lighter when it is traversing rough high-speed sections. Maneuvering the 767 pound machine in the air is another story, it’s heavy. Whether you land perfectly or not, the suspension can easily take a few feet of air. The Scrambler’s broad footprint is paired with 11.6 inches of ground clearance.Ground clearance is a big deal traversing rocks or negotiating rutted, muddy trails where you don’t want to frame out. Engine braking and four wheel disc brakes do a good job of slowing the machine in a hurry. No need crying about wishing for separate front and rear brakes. 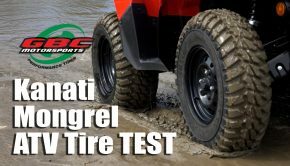 Polaris says all-wheel braking is necessary with their two-wheel/all-wheel-drive system. The brakes offer good feel and power and the engine braking felt natural and not overwhelming entering corners. Mini racks front and rear let campers and explorers bring along 25 pounds of front and 50 pounds of rear cargo.A 1.25 inch receiver allows you to tow 1,500 pounds. 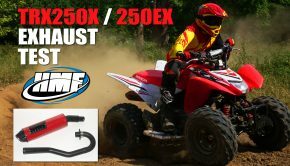 Most riders looking for a mega sport 4×4 for trail running or even GNCC racing will find the XP 850 more than capable in the motor department. The $9,499 retail of the base model 850 seems like a bargain at $3,800 less than the Scrambler 1000. Of course, if you want electric power steering, Fox shocks, and all of the other LE features on the 850 you’ll pay $11,999,$1,300 less than the $13,299 Scrambler 1000. For the rider looking for the ultimate 4×4 ATV, with the most power available for mudding, pulling, drag racing, or embarrassing their buddies at will, this is your ride! The Scrambler 1000 is not for beginners, novices, or anyone who isn’t 100% sure about what they’re doing when they pull the trigger. Too fast? Maybe. A lot of fun? You bet! Summary: For the rider looking for the ultimate 4x4 ATV, with the most power available for mudding, pulling, drag racing, or embarrassing their buddies at will, this is your ride! The Scrambler 1000 is not for beginners, novices, or anyone who isn’t 100% sure about what they’re doing when they pull the trigger.